My sons and I have been learning quite a lot about bugs recently. 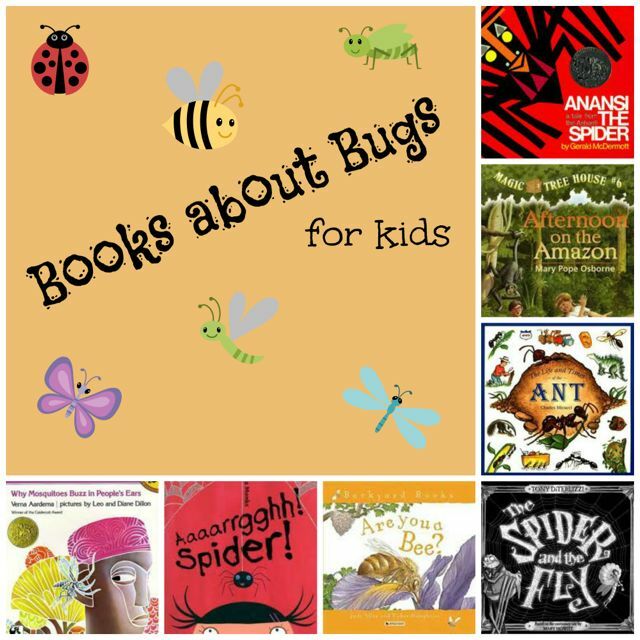 Along the way we have discovered some great books about bugs for kids. It started with a bee buzzing around us in the park. "How do bees make honey?" my son asked. "Well, they gather nectar from the flowers," I replied confidently, "and then they … um … er …". I falter. Good question. How exactly do bees make honey? Shouldn't I know that? When we got home a hasty search on-line for books about bugs for kids, and a short wait for the postman to deliver, resulted in my son and I settling down to read a couple of great books about bees. 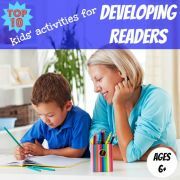 Keep reading to find out what we discovered about bees and other bugs, or check out our favourite storybooks about bugs for kids. Are You a Bee? by Judy Allen and Tudor Humphries is part of an excellent series for preschoolers from Backyard Books all about bugs for kids. 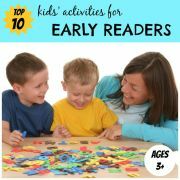 The series also includes books on the ant, butterfly, dragonfly, grasshopper, ladybug, snail and spider. The book begins by asking the reader if they are a bee. If so, "when you hatch, you are not a pretty sight. You are a larva." The book continues in this way, encouraging your child to imagine what it would be like to be a bee. It describes, in simple terms, the world of the bee. How does it explain how honey is made? You "…put the nectar and the pollen into storage cells. Mix some of the nectar with pollen to make beebread. Leave the rest of the nectar to turn into honey." For a more precise explanation of how to make honey, we turned to the second book, The Life and Times of the Honeybee by Charles Micucci. This is a much more detailed description of bees destined for older children. My six year old is fascinated by it, but my four year old can only follow for a couple of pages, after which he finds the detail too much. With wonderful illustrations and clear descriptions it explains everything from the specific chores a bee does in its first three weeks of life to how it performs a bee dance to show its fellow bees exactly where the flowers are. What about making honey? After sucking up the nectar the bee "stores it in her honey sac. While the field bee flies to the hive, her honey sac simplifies the sugar in nectar, so that it can change into honey." Back at the hive the nectar is spread on the roof of a honey cell, where it starts to dry. "During the next couple of days, other house bees fan their wings over the honeycomb. Fanning evaporates the moisture in nectar, which is 80 percent water. Honey is only 19 percent water. Finally, other house bees cap the honey cells with a thin layer of wax. Inside, the thickened nectar ages and becomes honey." Well, that answers that, then. We enjoyed finding out about bees so much that we decided to investigate other bugs. Another book in the Backyard Books series is Are You a Spider?, also by Judy Allen and Tudor Humphries. We loved it and my elder son clearly took in all the information. Recently we were having dinner outside and as it got dark he spotted a spider busily re-building its damaged web across one of the lamps. Although it had been weeks since we had read the book, my son confidently explained how the threads from the centre of the web to the edge were the strongest and the circular threads were really sticky to catch the flies. I was impressed! Why not head out into the garden or forest with your child and see if you can spot any spiders spinning their webs? The latest insect receiving our attention is the ant. 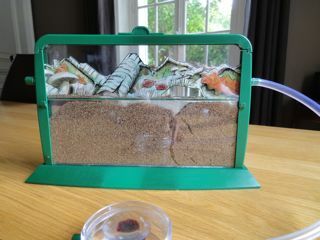 My son was given an ant farm kit a while back and we finally dug it out, set it up and went hunting for ants to fill it with (I know you can buy them, but that would have been too easy!) It wasn't until many hours later that I found the hint hidden in the instructions about putting a blob of jam into the specimen dish to entice the ants in. That would have saved a bit of time... Anyway, we did finally manage to get the ant farm up and running and it is fascinating watching them tunnelling through the earth and collecting food from the specimen dish. If you don't fancy setting up an ant farm, just encourage your child to observe ants in the forest or in your back yard. Place enticing pieces of food or obstructions in their path and see what they do. Follow them and see where they go. To understand more about this amazing little bug we read The Life and Times of the Ant, another great book about bugs for kids by Charles Micucci. This goes into a lot of detail about how ants communicate, reproduce and survive, and includes information on some predators, such as the anteater and ant lion. It also looks back at the history of the ant, which evolved from wasps more than 100 million years ago. My son was particularly fascinated by the pages describing some of the different kinds of ants that exist around the world and we found videos on the internet of some of them. We especially enjoyed these videos of leaf cutter ants and army ants. 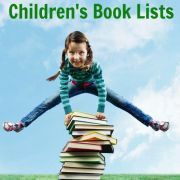 If your child enjoyed these factual books about bugs for kids they may also enjoy these other non-fiction picture books. 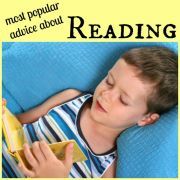 Here are some more ideas for great storybooks about bugs for kids. 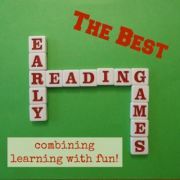 Those near the top of the list are best for younger listeners and those further down for older listeners or readers. Eric Carle's Very Little Library contains three of these classic books in board book format: "The Very Hungry Caterpillar", "The Very Lonely Firefly" and "The Very Busy Spider". 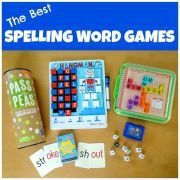 A perfect introduction to bugs for the little ones. Aaaarrgghh! Spider! by Lydia Monks tells the amusing tale of a spider who is desperate to become the family pet, but succeeds only in terrifying everyone. Anansi the Spider: A Tale from the Ashanti by Gerald McDermott was named as a Caldecott Honor Book. It is a traditional tale from Ghana in West Africa about Anansi the Spider, a clever and mischievous father, and his six spider sons. Why Mosquitoes Buzz in People's Ears by Verna Aardema and illustrated by Leo and Diane Dillon was the Caldecott Medal winner in 1976 and retells an ancient African myth. A mosquito tells a silly lie to an iguana which eventually leads to a jungle disaster. Two Bad Ants by Chris Van Allsburg is a beautifully illustrated book about bugs for kids which tells the story of two greedy ants who fall asleep in the sugar bowl and have a series of dangerous encounters trying to get back to the ant hole again. The Spider and the Fly by Mary Howitt is superbly illustrated by Tony DiTerlizzi. Mary Howitt's cautionary poem of 1829, in which a charismatic spider uses flattery to lure a fly to its death, is presented as a horror movie through DiTerlizzi's stunning black-and-while illustrations. Best for the over sixes. If you are a fan of the Magic Treehouse series by Mary Pope Osborne, check out Afternoon on the Amazon in which there is a chapter where Jack and Annie encounter a marching column of army ants. The Adventures of Maya the Bee by Waldemar Bonsels can be a bit difficult to get hold of in print but is available in electronic version, such as on iBooks for the iPad. This novel became a best seller when it was first published in 1912 and tells the story of an adventurous bee who abandons her hive to explore the world, meeting a number of different insects along the way. Charlotte's Web by E.B White is the classic story about everybody's favourite spider, Charlotte, who saves Wilbur, the pig, from slaughter by writing messages in her web.